I’m quite enjoying the cold here: been using the winter to work on house plans, automation and air sensors. Then last week I woke up to the news this morning that Google is discontinuing the Chromecast Audio. I’ve been using two of these and the versatility is amazing – love being able to group rooms together “play in all rooms” etc. Oh and the DAC is amazing (24/96, native FLAC etc). https://www.ifixit.com/Teardown/Chromecast+2015+Teardown/50189. So I ordered 8 more and needed a way to rack and stack them before they feed their audio signal into the 16 channel whole audio system. 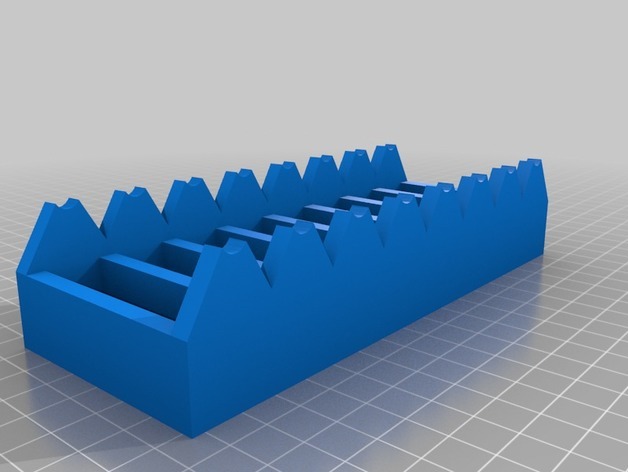 Then last week bashed together the “Chromecast Audio Rack” the following shape using Tinkercad (great tool btw). And finally we have a printed product and I drilled some holes in the sides (the original plan to have the cables resting was definitely not going to work). This way, the micro-usb and audio out cable hold the “puck” in place. As soon as the eight 3.5mm to RCA cables arrive from Aliexpress, I’ll wire those up to feed into the Apart amp….